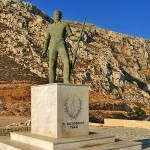 Turning southwest from Mirabello Bay, we drive through Kritsa village and up towards the Lasithiotika mountains. 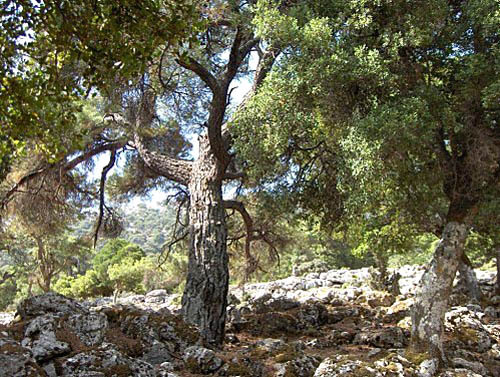 We are on our way to visit the research site of our friend Sabine, an archaeologist who is studying a Minoan farming community in a remote forest. 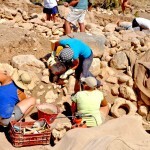 It’s not an exploration you might imagine (no digging in ancient ruins), but it is one of the most common types of archaeological work. 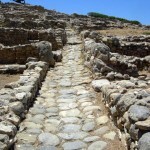 Archaeologists have been studying Minoan palaces and cities for over a hundred years. Much less is known about the lives of ordinary people. Sabine has focused her research on the way common folk lived during those ancient times. 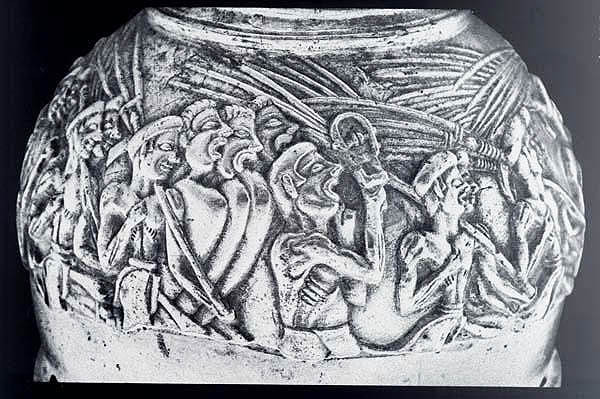 The only image of Minoan farmers we have seen is on the famous “Harvester Vase” of Ayia Triado (in the Iraklio archaeological museum). Around it is a low relief showing a happy procession of peasants carrying three-pronged pitch forks on their shoulders, singing as they march out to harvest the crops. Climbing higher into the mountains and passing through small farming villages, it is almost as if we are moving back in time. The last village is nearly deserted because most of the residents are in their orchards and fields tending crops and livestock. This is where food is produced for markets in lowland towns. Following Sabine’s instructions, we drive through a thinly forested area until we spot her car parked off the road. While collecting our gear from the trunk, we hear people talking on the hill above us. We follow the voices until we come upon Sabine, with her husband, two sons and daughter Lisa (who we met years ago on a survey project). These are her research assistants today. They are stringing twine between stakes along stone walls. At first glance, these might be any field walls. However, Sabine points out features of structural foundations. 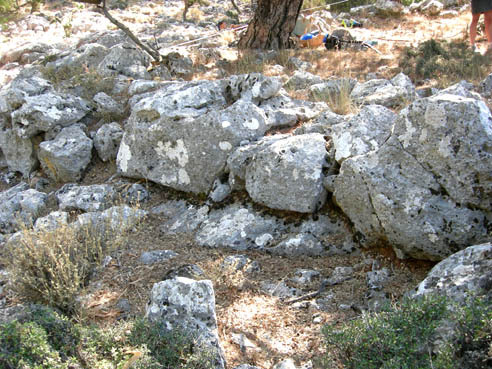 We are looking at a Minoan farmhouse with an attached livestock pen. Sabine is not here to investigate one farmhouse. She is studying the layout of an entire farming community: how the homesteads are distributed over the land, and their correlation with environmental resources. 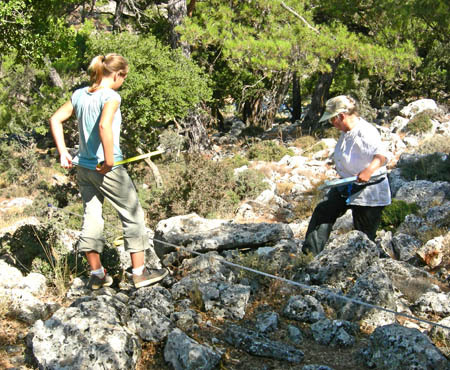 After doing a site survey to find evidence of archaeological remains, an archaeologist must decide what recording steps are needed. There are several ways to record a site. Some don’t require any high-tech equipment. 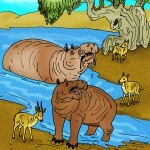 In fact, simple methods can be used by anyone with some basic tools and a familiarity with geometry. 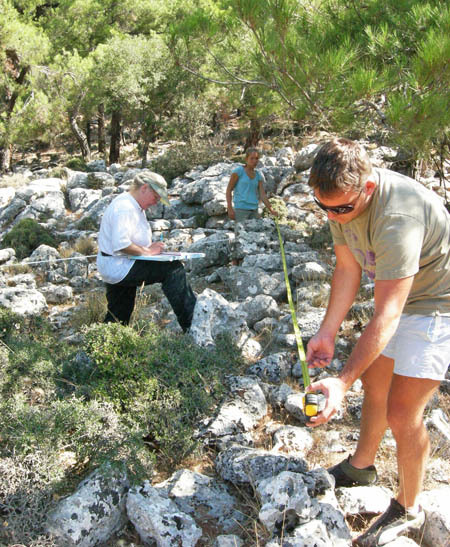 To record the exact location of features and artifacts, an archaeologist must measure distances and directions from a specified control point known as the site datum (usually GPS coordinates to which all measurements are tied). … the biggest square has the same area as the other two squares put together! Sabine has already established the site datum, and is now using a string grid and tape measure to mark off sections of the farming community into a network of adjacent triangles. This isn’t as easy as pacing off the distances at the site, but is definitely more accurate – and the results are more easily transferred to an area map. 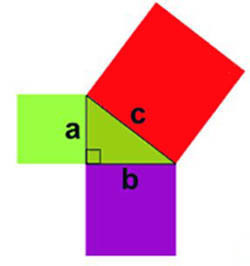 By constructing a series of triangles, each adjacent to at least one other, it is possible to determine distances and angles not otherwise measurable. 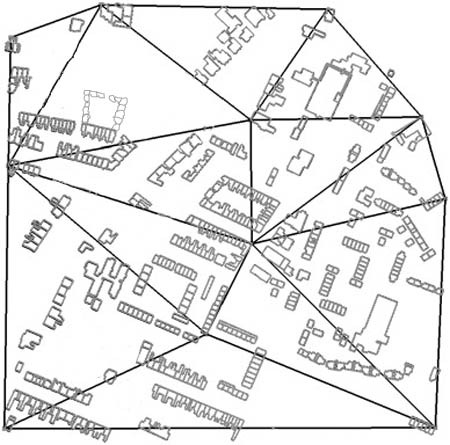 This method can be used to map archaeological features that are important to record. 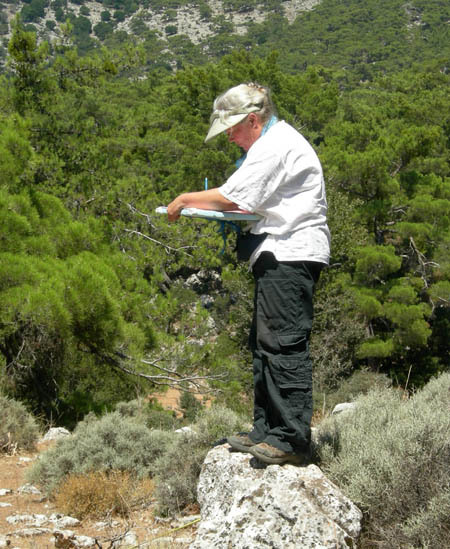 During the course of her research, Sabine has uncovered hundreds of Minoan farms of varying sizes – depending on the each farmer’s status and wealth (that is, the number of sheep and other animals he owns). 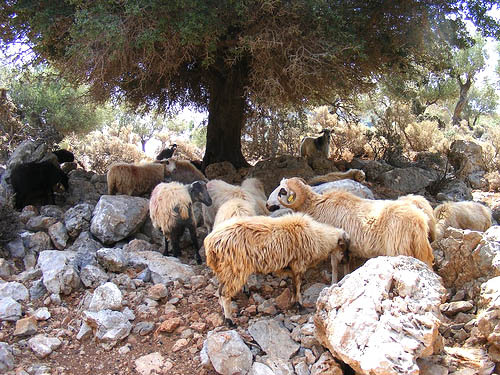 The area around us seems deserted, except for numerous bee hives and flocks of sheep foraging among the trees and rocks. 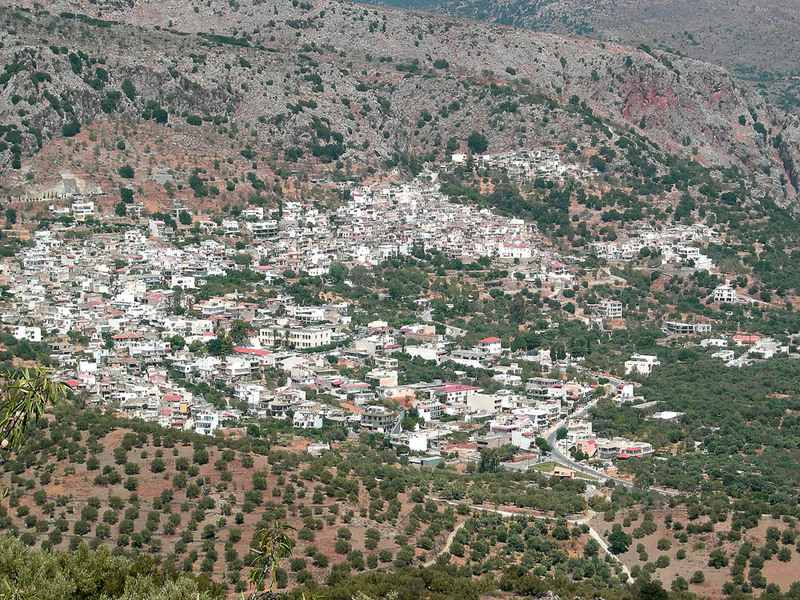 Although the farmers do not live here (they have houses in nearby villages), it is quite clear that nothing much has changed since ancient times. This region has always been famous for high quality honey, sheep milk cheeses, wool and meat production.